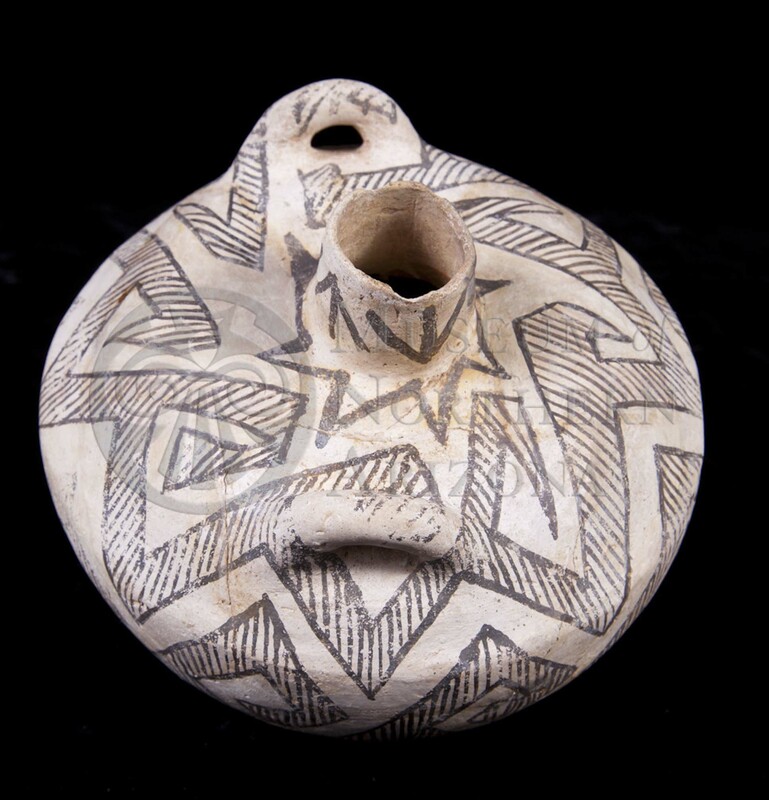 Gallup Black-on-white canteen from the Museum of Northern Arizona collections. Click the image to open the Gallup Black-on-white gallery. Gallup Black-on-white is a type of Cibola White Ware with a washy slip and hachured designs. Surface Finish: Decorated surfaces are well smoothed, often slipped and polished; slip is often thin and streaky. Forms: Bowls, pitchers, jars, and dippers. Paint: Black to brown to reddish brown, matte. Design: Parallel bands with diagonal and occasionally horizontal hatching running in parallel bands or filling triangles; solid elements are occasionally included as filler. Comparisons: Chaco Black-on-white designs are tighter and the hatching more closely spaced. Other Names: Puerco Gallup Black-on-white, Puerco Chaco Black-on-white, Puerco Chaco-Gallup Black-on-white, Chaco Black-on-white, and Chaco/Gallup Black-on-white.